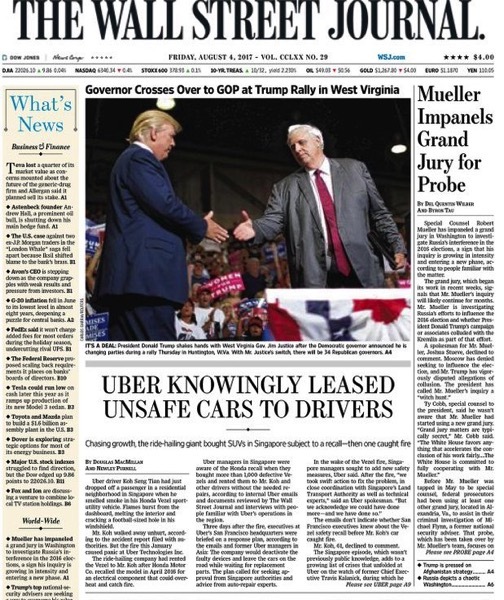 I’m late in mentioning this as I’ve been on the road for a few weeks — and if you follow me on Twitter, Instagram or Facebook this may be old news — but I wanted to link to a page 1 story I wrote with colleagues that ran earlier this month. Uber driver Koh Seng Tian had just dropped off a passenger in a residential neighborhood in Singapore when he smelled smoke in his Honda Vezel sport-utility vehicle. Flames burst from the dashboard, melting the interior and cracking a football-sized hole in his windshield. Mr. Koh walked away unhurt, according to the accident report filed with authorities. But the fire this January caused panic at Uber Technologies Inc. The ride-hailing company had rented the Vezel to Mr. Koh after Honda Motor Co. recalled the model in April 2016 for an electrical component that could overheat and catch fire. Uber managers in Singapore were aware of the Honda recall when they bought more than 1,000 defective Vezels and rented them to Mr. Koh and other drivers without the needed repairs, according to internal Uber emails and documents reviewed by The Wall Street Journal and interviews with people familiar with Uber’s operations in the region. Click through to see some images and read the rest. The story was followed by news outlets across the globe, including Bloomberg, Reuters, USA TODAY, CNBC, CNN, Quartz, Axios and more.